A couple weeks ago we brought out our portable X-ray fluorescence (pXRF) analyzer to aid in our study of some of the objects in the Artifact Lab. We provided an overview of this session earlier on our blog-read more by clicking here. One of the objects that we looked at with the pXRF is this painted wooden coffin. I also wrote a blogpost about this artifact and you can read more about it there. A critical part of the conservation process is examining and documenting objects-their materials, technology, and condition-all of this information is recorded in condition/treatment reports. 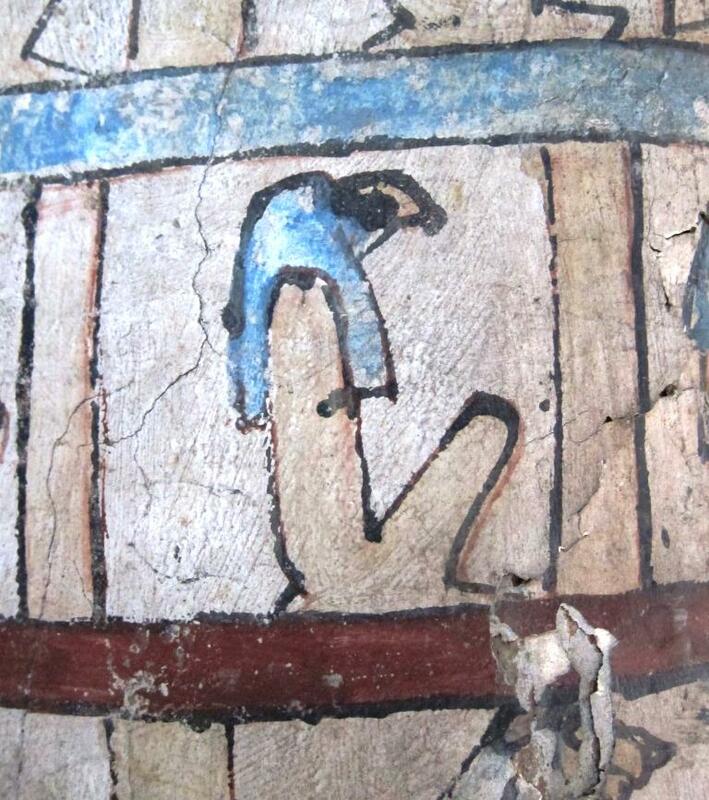 Beyond saying that this coffin was decorated with red, yellow, white, black, and blue paint, we would like to provide more information in our report about which pigments were used, if possible. Based on knowledge of the painting materials used in ancient Egypt, we had some ideas, and we were hoping that the pXRF could confirm that our ideas were on the right track. Considering that Egyptian blue was the principal blue pigment used in ancient Egypt, this was our first guess. Egyptian blue is a synthetic pigment, one of the first synthetic pigments ever produced, made by heating together copper, silica (sand), lime (calcium oxide) and an alkali such as natron (sodium sesquicarbonate). This pigment is found on objects from as early as the 4th Dynasty through to the Roman Period. The hue varies from dark to light blue, depending on the components and the grinding process (or the final particle size). Dark blue colors tends to have a larger particle size and smaller particles produce a lighter blue. 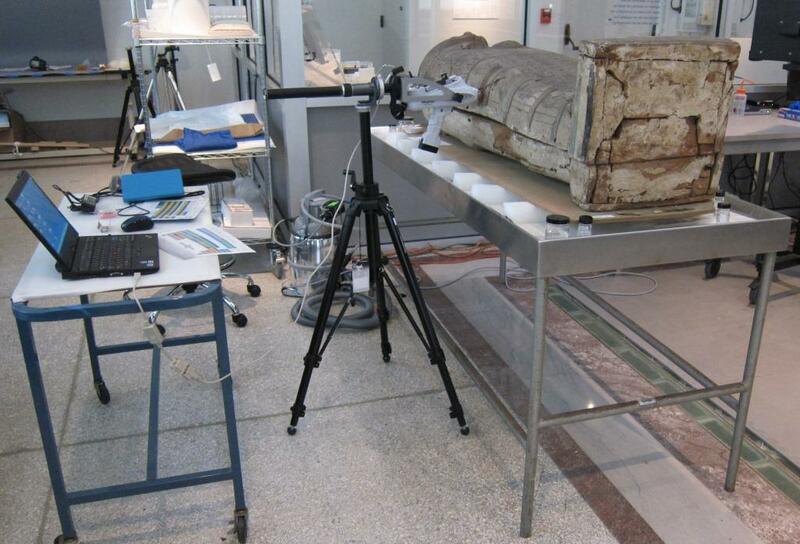 So how can the pXRF help us understand what blue pigment was used on this coffin? 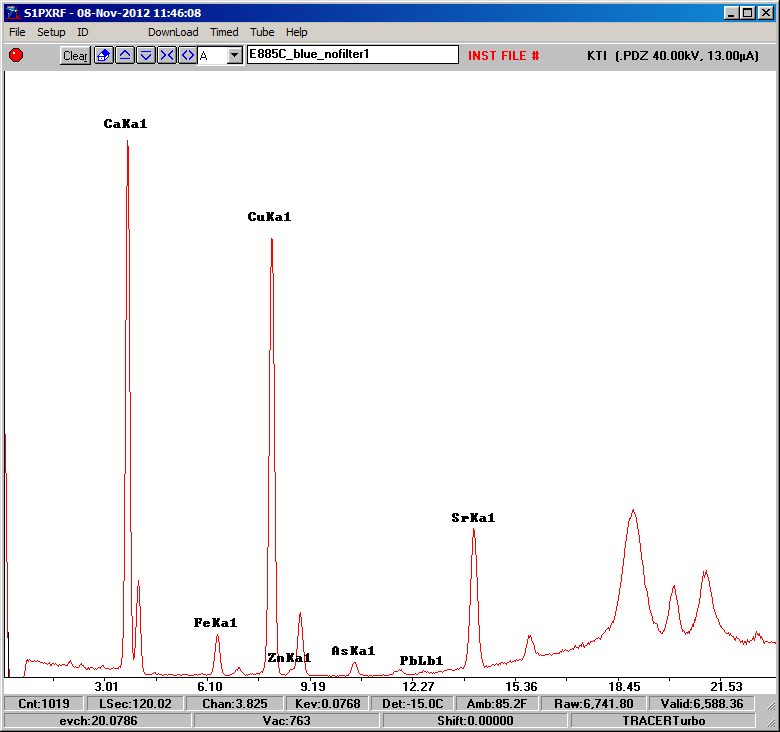 Well, as previously described, XRF is useful for identifying elements present in a sample or targeted area of an object. We simply positioned the pXRF in contact with the area of interest, in this case, a stable area of the blue paint, and took a reading. The reading produced a spectrum with peaks representing the x-ray energies of the elements present. Here we have labeled the peaks of each element detected-you can see that there are very high peaks for Calcium and Copper. This is what we would expect to see for an Egyptian blue pigment! We’re looking forward to continuing to use this technique for examining other objects in the Artifact Lab-especially those artifacts with only traces of paint left or those objects with surfaces that have darkened and where the original colors are more difficult to interpret. We’ll continue to update the blog with this information as we find out more. This entry was posted in analysis, Objects In the Artifact Lab and tagged Egyptian blue, painted wood, pigments, pXRF by mollygleeson. Bookmark the permalink. Well, *that* sounds interesting! Please share once you write it!